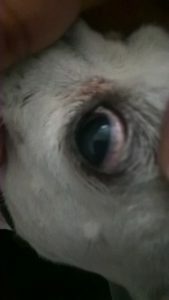 Abstract: Shyla is a 9 year old female spayed Teacup Chihuahua who presented for redness of her left eye in January 2017. The client was recommended to take Shyla to be examined by an ophthalmologist. The differential diagnoses consisted of episcleritis and conjunctivitis due to unknown causes. Shyla was prescribed ophthalmic steroids and seen for follow-up back at her primary veterinary care provider. In summary, the erythema persisted, medical acupuncture and continued ophthalmic steroids were the options and recommendations given. After a few weeks of acupuncture, I was able to make an actual diagnosis of which was causing the erythema in Shyla’s eye. History and Presentation: Shyla is a 9 year old female spayed Teacup Chihuahua. She presented for redness of her left eye in January 2017, which begin the last week of December 2016. The redness was noticed after a brief walk outside near taller dry grass. She was seen by CSU’s ophthalmology department and prescribed Neo-Poly-Dex ophthalmic ointment twice daily for two weeks. Shyla’s eye was somewhat steroid responsive, but the client was concerned about possible life-long steroid usage which she wants to avoid. The client also mentioned that Shyla has recently been limping intermittently on her left hind limb. Shyla was spayed at 3 years old without any complications. She has also had a few dentals performed in which teeth had to be extracted; there were no complications. Shyla has been otherwise healthy. Physical Examination and Clinical Assessments: Physical Examination: Shyla’s ophthalmic examination revealed a moderate erythematous sclera, moderate epiphora, mild blepharospasm, and moderate edema of the left eye. Shyla’s left stifle was stable, but a partial cranial cruciate ligament rupture was revealed. Shyla has multiple missing teeth due to previous dentistry work exposing loose teeth. The remainder of Shyla’s examination was unremarkable. Myofascial exam: Shyla had tight bands bilaterally along her neck, shoulder, and pectoral musculature. She attempted to sit down and lick my hand as I palpated her left hind limb. There was no obvious muscle atrophy present during the first session. The second session revealed mild atrophy of her left quadriceps and hamstring muscles. 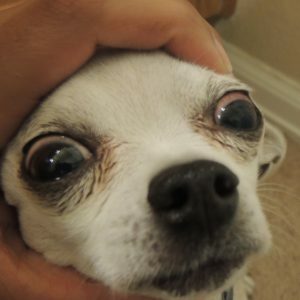 Clinical Assessments: Shyla’s ophthalmic examination revealed a moderate erythematous sclera, moderate epiphora, mild blepharospasm, and moderate edema of the left eye; no ulcerations were present. Shyla’s left stifle was stable, but a partial cranial cruciate ligament rupture was revealed. Medical Decision Making: I arrived at my particular acupuncture approach and sequence of treatments from history, physical exam, and myofascial exam. The main issues I observed during my exam included the following: inflammation of Shyla’s eye and possibly her stifle, direct pain in her eye and stifle, and compensatory trigger points in her neck, shoulders, and pectoral regions. She also had mild atrophy of her left quadricep and hamstring muscles. I chose the eye points to stimulate trigeminal and facial nerves to avoid dry eye by invoking tear production, induce analgesia, and cause blood flow changes. GV20 and GV14 were used for activating the autonomics and adding analgesic effects via trigeminal, cervical spinal, and cervicothoracic spinal nerves. BL10 had parasympathetic and anti-inflammatory effects via the cranial cervical spinal nerves. GB20 also stimulated the cranial cervical spinal nerves. GB21 worked via activating the spinal assessory nerves in order to relieve regional muscle tension in Shyla’s thoracic limb. 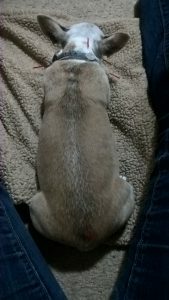 I chose Bai Hui, ST34, ST36, SP10, KI3, and BL60 in order to stimulate nerves going to the left pelvic limb; this allowed communication between lumbar spinal segments and hind feet so Shyla would be able to stand and walk properly. Differential Diagnoses: Conjunctivitis and Episcleritis were my differential diagnoses. I arrived at these by doing a thorough ophthalmic examination. I was able to rule out anterior uveitis based on normal pupil sizes, absent flare, and normal intraocular pressures. No foreign bodies were present. Definitive (or Putative) Diagnosis (or Diagnoses): The definitive diagnosis is primary scleral abrasion causing secondary conjunctivitis. I arrived at this diagnosis after Shyla had two treatments of acupuncture which included specific eye points. 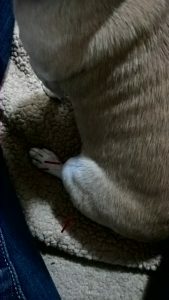 After Shyla’s second treatment, I performed another ophthalmic examination which showed that Shyla no longer had generalized erythema, epiphora, edema, nor blepharospasm of her left eye. Due to this remarkable improvement, a focal abrasion located on the dorsal (12 o’clock) aspect of her left sclera was revealed. • Treatment 1 Monday, 6/5/2017: I used GV20 and GV14. Treatment 2 Monday, 6/19/2017: I used GV20, GV14, and BaiHui. Bilaterally, I also used BL10 and GB21. Treatment 3 Monday, 7/10/2017: I used GV20, GV14, and BaiHui. Bilaterally, I also used BL10, GB20, LU1, and GB21. On her left side, I used GB1, BL2, ST34, ST36, and SP10. Treatment 4 Thursday, 7/27/2017: I used GV20, GV14, and BaiHui. Bilaterally, I also used BL10, GB20, LU1, SI11, SI12, and GB21. On her left side, I used GB1, BL2, ST34, ST36, SP10, and trigger point just lateral to BL17. KI3 with BL60 were attempted, but not tolerated on the left. Summary: All points, except KI3 and BL60, were stimulated by dry needling; KI3 and BL60 were stimulated by acupressure. Before and after each treatment, I used massage therapy to calm and relax Shyla. Bai Hui, ST34, ST36, SP10, KI3, and BL60 were used for stifle pain. GV20 and GV14 were for activating the autonomics and adding analgesic effects. GV 20 was also used to decrease agitation and reduce headaches due to eye pain. BL10 had parasympathetic and anti-inflammatory effects, which resulted in more relaxed muscles in the neck, shoulders, and pectorals. GB20 was also used for decreasing eye, head, and neck pain. GB21 helped reduced shoulder pain. Other adjunctive treatments included Neo-Poly-Dex ophthalmic ointment for Shyla’s eye, massage, and physical therapy for her hind limb. Shyla had one treatment of acupuncture and physical therapy every two to three weeks for three treatments. She had two treatments of massage each week, which continued daily at her home. 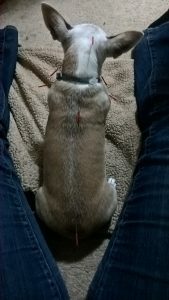 I recommended future treatments of laser and electroacupuncture stimulation for Shyla’s left stifle, since it was unfortunately temporarily unavailable at my practice. Outcomes, Discussions, and References: Outcomes: Shyla’s conjunctivitis was caused by an abrasion. The scleral abrasion was masked by the erythema and edema, which was diminished by acupuncture in combination with Neo-Poly-Dex ophthalmic ointment. No adverse events occurred. Shyla’s left hind limb also greatly improved with acupuncture combined with strengthening exercises. Discussions: I learned that acupuncture can be used as an actual diagnostic tool, and not only as a treatment. My thoughts of partial cranial cruciate ruptures not all requiring surgery, as long as other proper treatment, such as acupuncture, physical therapy, and laser were also confirmed. More medical research is implicated for canine eye issues, especially, conjunctivitis and acupuncture results due to the very long differential list associated with causes of conjunctivitis. Acupuncture should be performed in clinical practice when no definitive diagnoses of conjunctivitis are determined and treatments have no results; acupuncture is able to help truly diagnose the cause of conjunctivitis in some cases. References: Cheng, Han-Wen, and Allison Faber Marshall. “TCVM for the Treatment of Eye Diseases.” AJTCVM, vol. 11, no. 2, Aug. 2016, pp. 79–87. EBSCO, aatcvm.org/JournalFlash/vol11no2/13pearls.pdf. Accessed 16 July 2017.